Jazz critic Leonard Feather said in his Encyclopedia of Jazz in the Seventies, that Doug Carn was destined from birth to be a part of the world of music. His mother, Gwendolyn Seniors Carn, taught music in the public schools in St. Augustine, Florida and played piano and organ. His Uncle Bill Seniors, was a jazz aficionado and Be-bop DJ. Gwendolyn had played with Dizzy Gillispie on two occasions and Bill was a close friend of Stanley Turrentine and Shirley Scott. Doug’ s step-dad Joseph Wait­ man didn’t mind driving a bunch of teenagers all over the Southeast. These three people and their resources helped Doug tremendously in his early development as an artist and a young man. 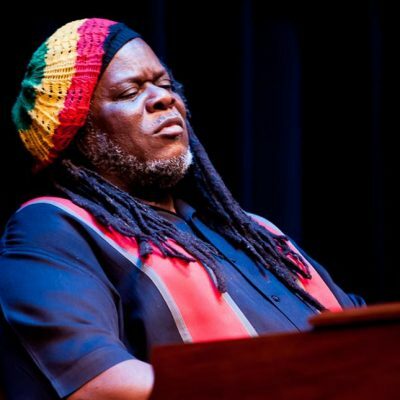 The multi-faceted talents of pianist-organist-lyricist Doug Carn began to emerge onto the contemporary Afri­ can-American music scene during his teenage years. His group the “Nu-Tones” played a variety of dances, proms and club dates during his high school years in St. Augustine, Florida. Strongly influenced by the tradition of hard swinging, blues based “jump” bands from the Florida School for the Deaf and Blind that existed for more than a decade in the wake of the Great Ray Charles, Doug Carn sta1ted to forge a very special conception and mental picture of what Black music, jazz and the velocity of swing was all about. After studying the oboe at Jacksonville Unive rsity, Doug went to Georgia State College in Atlanta. During the next few years Doug’ s expertise on the Hammond B-3 organ took a giant “leap” forward as he literally “sat at the feet” of practically all of the great jazz organ masters. This was due to the fact that “Paschal’s La Carousel” periodically brought in Jimmy Smith and the “Bird Cage” always presented artists like Jimmy McGriff, Charles Earland, Groove Holmes, Shirley Scott, Chester Thompson, Trudy Pitts, Gloria Coleman, Lonnie Smith, Jack McDuff, Johnny Hammond Smith and Rhoda Scott. This environment, along with the dynamics of the civil rights struggle and the African-American “B lack Cul­ tural Revolution,” provided a fertile ground for Doug’s continuing musical development. By the date of his eight­ eenth birthday, Doug had released his first LP “The Doug Carn Trio” on the Savoy label. It was shortly after this time that Doug met Jean who was studying at Morris Brown College. Her outstanding vocal abilities soon landed her the position of featured vocalist with the Doug Carn Trio. Jean’s perfect intonation and phenomenal range, made her voice the perfect vehicle for the ideas that Doug was in the process of developing. These ideas were centered around the expansion of the jazz vocal repertoire in the direction of more contemporary writing standards established by modern “players” and composers like, Coltrane, Silver, Davis, Shorter, Morgan, Hutcherson and Tyner. Doug and Jean soon developed a personal relationship as well and embarked on a creative adventure that was destined to set a ” new standard” and become a “benchmark” for dozens of other great artists in future decades. During the hey-day of the Vietnam era and the months after the assassination of Dr. King, Doug and Jean and a score of “jazz” artists from the Greater Atlanta area migrated to southern California in search of greater opportunities and recognition. These artists included people like Sidney Miller, Jr., Doc Soul Stirrer, Kiesa Brown, Billy Mitchell, John and Mike Bolivar, the Mighty Hannibal and Dee Dee Cantrell, as well as Fred Wesley, George Harper and Ernest Vantrease. Doug soon found himself living in the same apartment building with Earth Wind and Fire, Mandrill, the Chambers Brothers, Janis Joplin, Famous Amos, the soon to be Reverend “Ike,” and Ruth Buzzi of Laugh-In fame, who often babysat for Doug and Jean. Because of this particular “Landmark” location in Hollywood, people like Joe Zawinul, Larry Young Jr., Tony Williams and other celebrated “sidemen” were occasional guests for gigs at Shelly’s Manhole. It was during this time that Doug and Jean recorded two albums, the first two on Warner Bros., with Earth Wind and Fire. Shortly afterwards, Doug recorded his first album for the newly formed Black Jazz label. That al­ bum Infant Eyes, was an underground hit and caused much controversy as related to the politics of jazz and the appropriation of jazz by the “white” establishment of the time. However, Doug’s fan base continued to grow worldwide and all of his recordings of this period made the best seller charts of Billboard, Record World and Cash Box magazines . In 1974 according to Billboard Magazine, Doug Carn sold more records than Dave Brubeck and Ramsey Lewis. By the time of Doug’s fourth LP for Black Jazz “Adam’s Apple”, Doug had performed to the largest audience in the history of the Village Gate and had made his Carnegie Hall debut. Also, during this same period, Doug and Jean Carn had “broken up” and gone their separate ways as husband and wife and performers. Jean went on to record a series of ” hits” with Gamble and Huff on Philadelphia International Records and with Motown as Doug struggled to maintain his balance and recover. During the next few years a fundamental change began to take place in the Black Community, on the cultural level, that is. This change was basically a move away from overtly Afro-centric themes. This change was primarily due to two factors, the greater integration of American Society as a whole and the subsequent decline of the development of Black institutions by Blacks for Blacks. Therefore, artists like Doug Carn, Pharaoh Saunders, Leon Thomas, Olu Dara, Carlos Garnette, Gary Bartz, Dee Dee Bridgewater and McCoy Tyner suffered greatly except those who were willing and or able to change to a more “straight ahead” or “standard” direction. Around this time, perhaps a decade or more, Doug practically ceased to perform as a band leader and worked mostly as a sideman with artists like Stanley Turrentine, Hank Crawford, Charlie Rouse, Junior Cook, Nat Adderly, Monk Montgomery, Houston Person, Marlena Shaw and Frank Morgan. Suddenly, a bunch of “new school” organ players started to appear. Eugene Ludwig, came out with an album in 1975 and Downbeat magazine finally took the organ out of the miscellaneous category in its music polls. Now the Hammond B-3 organ groove had more or less “crossed over” and was gaining a new sense of popularity. Doug wasted no time in taking advantage of this new situation. For here we have a bunch of new kids on the block getting all of this “recognition” for what he and his peers had done already twenty years earlier. The show went on the road. First with the U Street project, with Wallace Roney, Gary Thomas, and drummer Steve Williams at the One Step Down in Washington, DC. Then a five nation European tour of Sweden, Poland, Austria, Germany and Italy. These shows as well as Doug ‘s two performances at the Jazz Cafe in London and the Hip­ Bop organ grooves CD re-established Doug Carn on the world stage. Also during this period all of Doug’s Black Jazz recordings were reissued on CD in the U.S., England and Japan. Now in his prime Doug Carn works out of Palm Coast, Florida and Savannah, Georgia producing and perform­ ing shows in “his own” venues and Jazz festivals with artists Curtis Fuller, Eddie Henderson, Antonio Hart, Vincent Gardner, Charles Tolliver, Bill Pierce, Frank Lacey, Bill Saxton, Danny Mixon, Andy McCloud, Dave Valentin, Fred Wesley, Giocoma Gates, Freddie Cole, Bobby Watson and Javon Jackson. Some of these artists like Laika Fateen appeared with Doug at his club, Adagio in Savannah. Others came to Florida for the Northeast Florida Jazz Association, NEFJA.org, of which Doug is the vice president. There have also been gigs with Kent Jordan, Marlon Jordan, Stephanie Jordan, Bunky Greene, Ernestine Anderson, Benny Golson, Freddie Hubbard, Vanessa Rubin and Vincent Herring. A special note should also be given to club dates in New York with Cindy Blackman, at the Iridium, Lenny White at Birdland, Kenny Garrett and Joey DeFrancesco at S.O.B.’s, and Ben Dixon and Sonny Simmons at the Jazz Standard. Then came the Big Band and Oliver Nelson Jr. Always moving forward Doug established his first big band in Savannah, Georgia, shortly after 9/11. After realizing there were practically no big bands being led by an organ, Doug discovered Oliver Nelson’s Son had most of the arrangements done by his father for Jimmy Smith during the Verve Years. This exciting music has been rarely performed and has formed the basis of the Doug Carn Big Band repertoire. With the talented Dr. Oliver Nelson, Jr. conducting and playing flute. Doug performed to highly enthusiastic audiences at the 2009 Savannah Jazz Festival and in 2010 in San Jose for the San Jose Jazz Association, where Doug played and conducted. Amazingly, after more than 35 years, Doug and Jean have re-united. First at Spelman College in Atlanta, September 2010, then for the Central Brooklyn Jazz Consortium, December 2010 and in Daytona Beach, Florida, January 2011 at the Museum of Arts and Sciences. At each performance the audience was brought to tears of joy and standing ovations as they heard their favorite Doug Carn compositions being performed by Doug and Jean on stage together again. Doug and Jean backed up by Young Lions, Stacey Dillard on sax, Duane Eubanks, trumpet, Rashaan Carter, bass and Russell Carter, drums performed well known favorites, Infant Eyes, Revelation, Power and Glory, Peace, A Love Supreme, Little B’s Poem and many more with excellence and aggressive musicality. It’s as if Doug and Jean never separated musically at all. Both artists have matured, but are stronger than they ever were. A new album is in the works as well as upcoming gigs at Dizzy’s Coca Cola in New York City and Ronnie Scott’s in London. In this all-star group, Doug is featured on the Hammond B-3, Clavinet and Moog Synthesizer; thrilling the crowds with his solos and technical prowess; especially his footwork on the Hammond B-3 Pedals.